HAZRAT ABDULLAH SHAH GHAZI ( RAHMATULLAH ALLAIH ) is one of the Greatest and Famous Sufi saint. Hazrat Abdullah Shah Ghazi (RA). Belongs to the 4th generation of Hazrat Amir ul Momineen Hazrat Ali Karam Allahu Wajhu. Hazrat Abdullah Shah Ghazi (RA) migrated from Arab to Karachi area and took wisal here. this dargah shareef is a great tabaruk and many people get cure by drinking this water. It is places of Auliyas ( Great friends of Allah ) where you will find Such Miracles. Below is list of Other Dargah Shareefs where you will find such karmats of Water. Well at Dargah of Hazrat Daata Ganj Baksh Ali Hajveri (RA), Lahore. Water of Manick Dharah of Dada Hayath Mir Qalander ( Baba Budan Giri Hills ) , Chickmangalur, Karnataka. Sacred Water at the dargah shareef of Hazrat Mujadid Alif Sani (RA), Sirhind. Hazrat Usman Shah Vali (RA) ( Kolar – when baba gave a punch (hit) to the hill with his hand water came and the place is famous as Gaimukh in Kolar, Karnataka ). 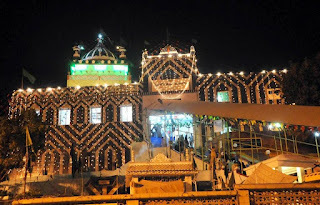 There is a great connection between this Sahabi Hazrat Syedina Malik Dinar (Razi Allahu Taalahu Anhu ) and Taabayee Hazrat Syed Shareef ul Madni ( Qaddas Allahu Sirra Ul Azeez ). Both have come for spread islam on Arabian sea that too with karmats. Abdullah Shah Ghazi is considered to be patron saint of Karachi, Sindh, Pakistan. The dargah of Abdullah Shah Ghazi is located in Clifton neighbourhood of Saddar Town in Karachi. Many say that peoples’ faith in the saint is not entirely unfounded. Legend has it that Abdullah Shah Ghazi was able to control the sea waters using a bowl in the sea and ordering it to remain calm. “This was done to help the fishermen who approached him because they were unable to earn their livelihood in the rough sea,” narrates Ahmed. The saint is believed to have pressed the bowl from both sides in the sea while narrating a prayer, asking for the waters to remain calm. A few hours later, the fishermen were back at work. It was perhaps due to this belief that most fishermen in Sindh chose to ignore the warnings issued by the Pakistan Meteorological Department and the Tropical Cyclone Warning Centre, while residents along Sea View evacuated their homes. Born in the year 720 in one of the holiest cities in Islam, Madina, Abdullah Shah Ghazi was the great grandson of the Holy Prophet (pbuh) from the historical tribe of Bani Hashim. He was educated in Madina until the year 760 when he migrated to Sindh as a merchant. He was given a warm welcome as he belonged to the Saadat family, one of the noblest in Islam. Another version of Shah Ghazi’s life has been given by the internationally acclaimed scholar and historian, Dr Umar Bin Mohammad Daudpota . According to him, Abdullah Shah’s real name was General Abdulla bin Nabhan. He, along with Badil bin Tuhafa, another commander, launched a military expedition against Raja Dahir, the local ruler who was encouraging pirates to raid Arab ships. Consequently, war ensued at Debil, modern day Karachi. Later, the mission was entrusted to Muhammad Bin Qasim. While the young commander forged ahead to Multan, Abdullah Shah continued to live in Sindh with the people he loved, teaching them the principles of Islam and spreading his love for humanity. Back then Sindh had plenty of wildlife — ibex, urial, blue bull, gazelle and deer — and Abdullah Shah was fond of hunting. One day, in his passion for hunting, Abdullah Shah wandered far from the base and was intercepted by the enemy. Out-numbered, he preferred to fight rather than surrender. Because of this display of valor, he was given the title of Ghazi (Victorious). He died in 773 and was buried near the sea in Karachi. His tomb is built on a very high platform, but the actual grave is below the stairs. His mazaar attracts a steady stream of devotees for a number of reasons: for preaching love and tolerance, and warding off tropical disasters. As recent events show, it seems to work.